It's gut check time for healthcare reform and as the Senate is headed into a marathon weekend of debate and make or break procedural votes (not to mention Republican stall tactics), all in the face of an actual winter snow storm, the widow of Senator Ted Kennedy has written an op-ed for the Washington Post IN FAVOR of the Senate Health Reform Bill. It will be interesting to see it this can add a little more momentum in favor of passing this version of the bill and take a little steam out of the opposition which now not only includes every single Republican, but also Howard Dean, and some very influential progressives calling for the Senate to "Kill the Bill." 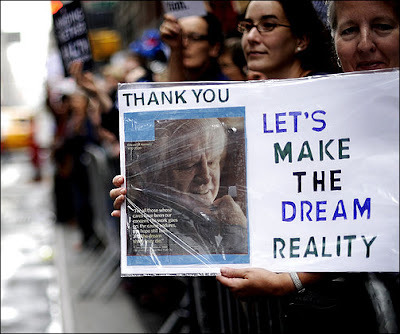 My late husband, Ted Kennedy, was passionate about health-care reform. It was the cause of his life. He believed that health care for all our citizens was a fundamental right, not a privilege, and that this year the stars -- and competing interests -- were finally aligned to allow our nation to move forward with fundamental reform. He believed that health-care reform was essential to the financial stability of our nation's working families and of our economy as a whole. Still, Ted knew that accomplishing reform would be difficult. If it were easy, he told me, it would have been done a long time ago. He predicted that as the Senate got closer to a vote, compromises would be necessary, coalitions would falter and many ardent supporters of reform would want to walk away. He hoped that they wouldn't do so. He knew from experience, he told me, that this kind of opportunity to enact health-care reform wouldn't arise again for a generation. In the early 1970s, Ted worked with the Nixon administration to find consensus on health-care reform. Those efforts broke down in part because the compromise wasn't ideologically pure enough for some constituency groups. More than 20 years passed before there was another real opportunity for reform, years during which human suffering only increased. Even with the committed leadership of then-President Bill Clinton and his wife, reform was thwarted in the 1990s. As Ted wrote in his memoir, he was deeply disappointed that the Clinton health-care bill did not come to a vote in the full Senate. He believed that senators should have gone on the record, up or down. Ted often said that we can't let the perfect be the enemy of the good. He also said that it was better to get half a loaf than no loaf at all, especially with so many lives at stake. That's why, even as he never stopped fighting for comprehensive health-care reform, he also championed incremental but effective reforms such as a Patients' Bill of Rights, the Children's Health Insurance Program and COBRA continuation of health coverage. -- Insurance protections like the ones Ted fought for his entire life would become law. -- Thirty million Americans who do not have coverage would finally be able to afford it. Ninety-four percent of Americans would be insured. Americans would finally be able to live without fear that a single illness could send them into financial ruin. -- Insurance companies would no longer be able to deny people the coverage they need because of a preexisting illness or condition. They would not be able to drop coverage when people get sick. And there would be a limit on how much they can force Americans to pay out of their own pockets when they do get sick. -- Small-business owners would no longer have to fear being forced to lay off workers or shut their doors because of exorbitant insurance rates. Medicare would be strengthened for the millions of seniors who count on it. -- And by eliminating waste and inefficiency in our health-care system, this bill would bring down the deficit over time. Health care would finally be a right, and not a privilege, for the citizens of this country. While my husband believed in a robust public option as an effective way to lower costs and increase competition, he also believed in not losing sight of the forest for the trees. As long as he wasn't compromising his principles or values, he looked for a way forward. As President Obama noted to Congress this fall, for Ted, health-care reform was not a matter of ideology or politics. It was not about left or right, Democrat or Republican. It was a passion born from the experience of his own life, the experience of our family and the experiences of the millions of Americans across this country who considered him their senator, too. The bill before Congress will finally deliver on the urgent needs of all Americans. It would make their lives better and do so much good for this country. That, in the end, must be the test of reform. 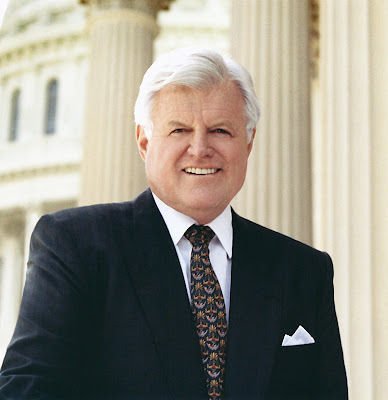 That was always the test for Ted Kennedy. He's not here to urge us not to let this chance slip through our fingers. So I humbly ask his colleagues to finish the work of his life, the work of generations, to allow the vote to go forward and to pass health-care reform now. As Ted always said, when it's finally done, the people will wonder what took so long. Victoria Reggie Kennedy, the widow of Sen. Edward M. Kennedy (D-Mass. ), is an attorney. So glad my last final is tomorrow and I will have no school to worry about just in time for the CLOTURE vote (read: Game, Set, Match) at 1am on Monday morning!